An etching, drawn and engraved by Thomas Miller, depicting the church of Saint Paul's in Covent Garden; published by T. S. Simpson in London, 1796. St. Paul's Covent Garden (known as The Actors' Church) was designed by Inigo Jones and was the first Anglican church to be constructed in London since the Reformation. The patron, Francis Russell, 4th Earl of Bedford, did not want to spend a huge amount on its construction and requested that it be "not much better than a barn", to which Jones was said to reply, "Well then, you shall have the handsomest barn in England". As The Theatre Royal, Drury Lane and The Royal Opera House are all within the parish the church has been synonymous with the acting profession since it was built. A disastrous fire destroyed much of the church in 1795 but it was subsequently rebuilt to its original design. 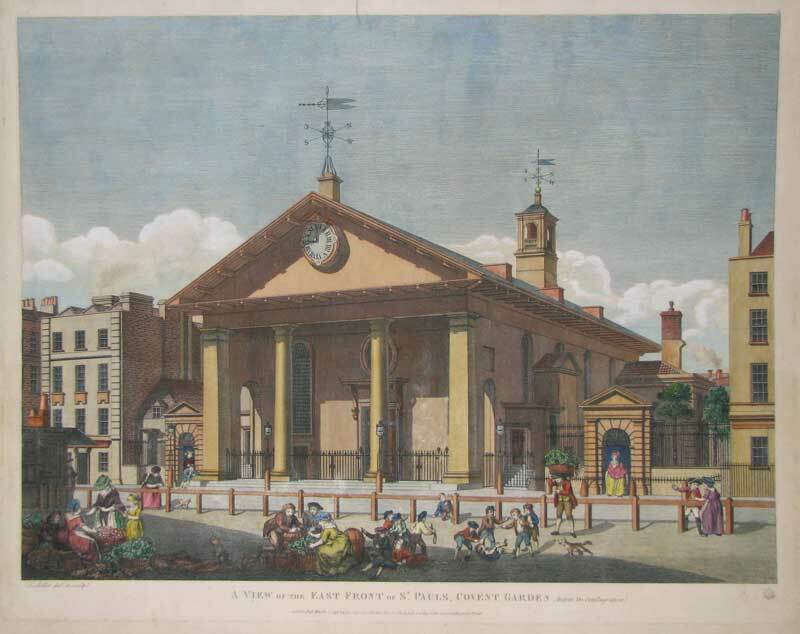 This print shows the church as it was before the fire. The foreground is enlivened by figures commonly associated with Covent Garden; fruit and vegetable vendors jostle for pavement space with flower girls and street urchins. The scene is evocative of Eliza Doolittle and My Fair Lady.